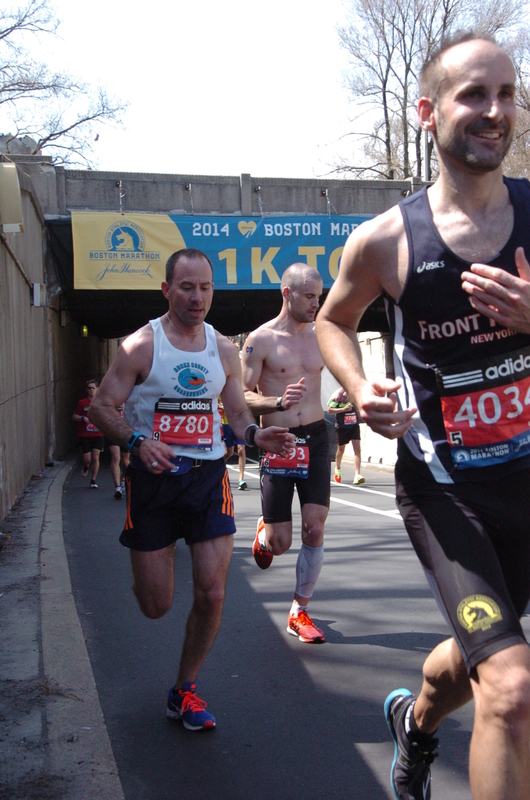 You are here: Home » The 2014 Boston Marathon! 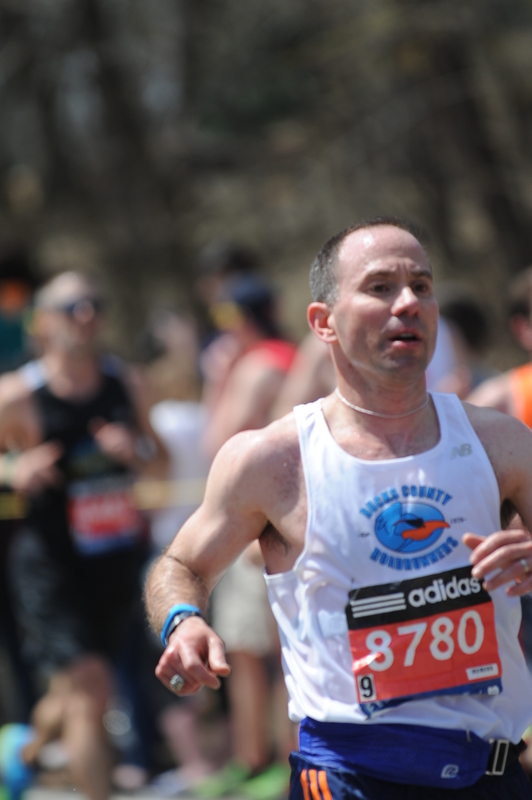 It is hard to believe but the 2014 Boston Marathon has come and gone. What a great weekend it was! 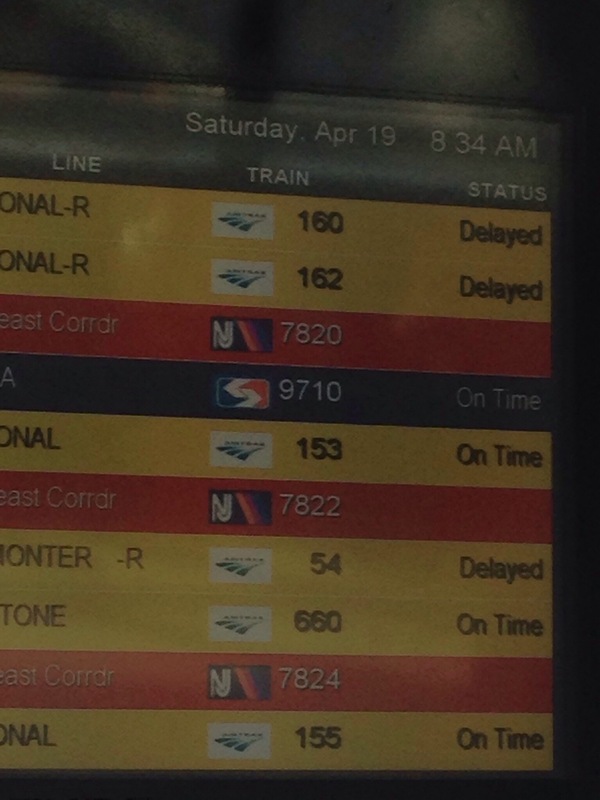 The weekend started out on a down note as the train from Trenton NJ, to Boston was delayed over three hours. Rather than wait we made the decision to get our money back for the train tickets and drive. North East Corridor Train DELAYED! Once in Boston you could just feel the energy. 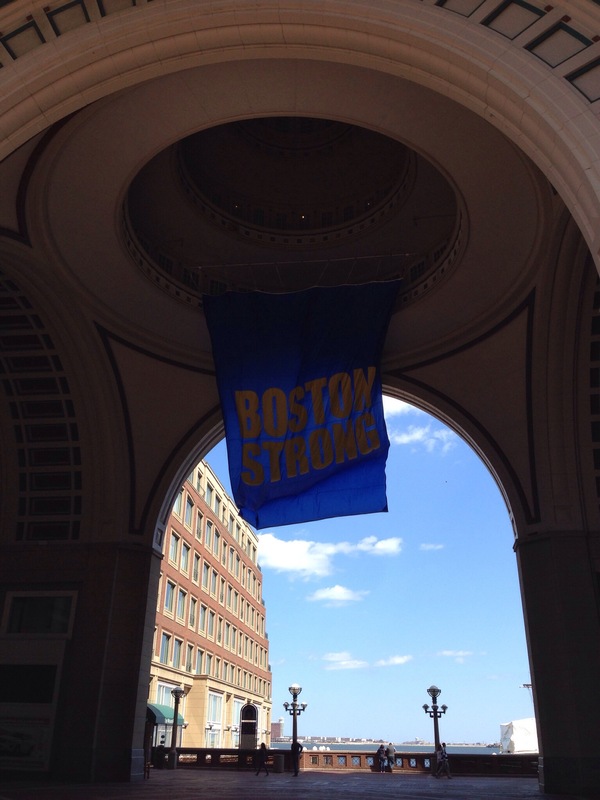 The entire town was BOSTON STRONG! We quickly checked in and made our trek out to the EXPO. On the way to the EXPO we were able to get a family selfie at the finish line! 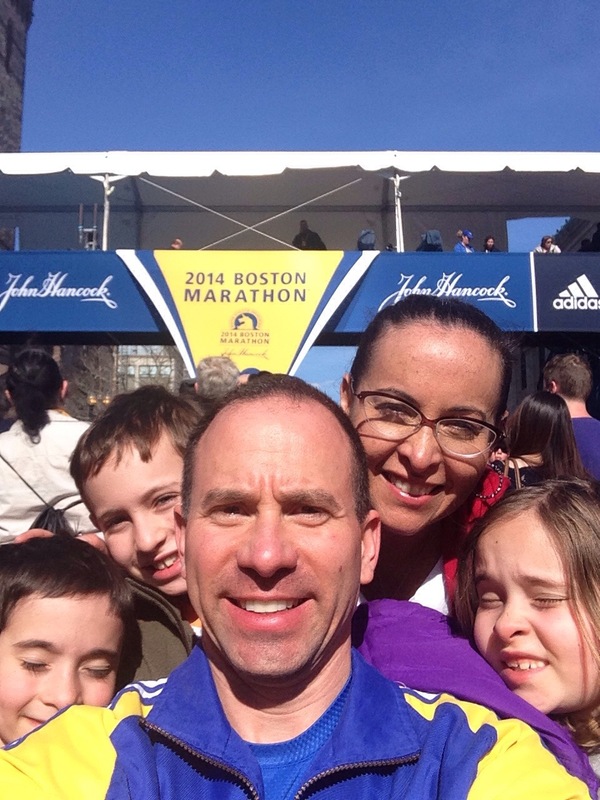 Family Selfie at Finish Line! 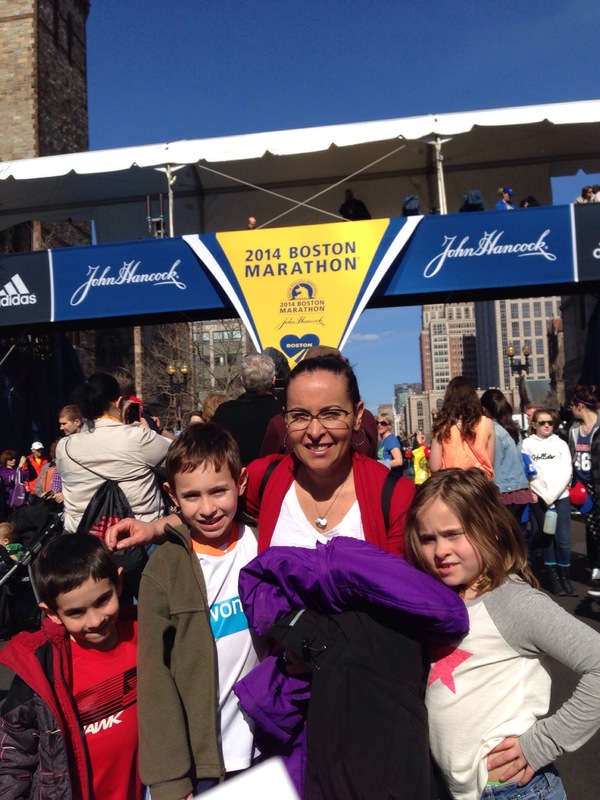 Leslie and the kids at the finish! 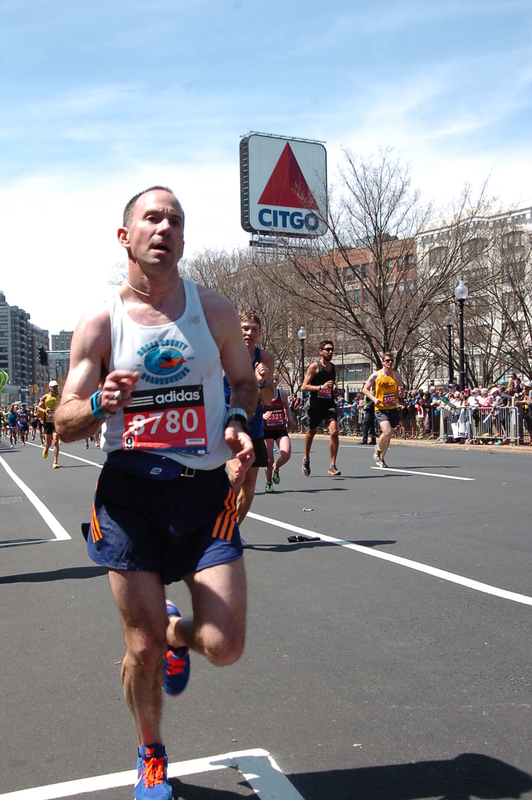 The Boston Marathon EXPO is like no other. It it not only huge but there is just so much going on. While it may have been tough for the kids and Leslie I had a blast. 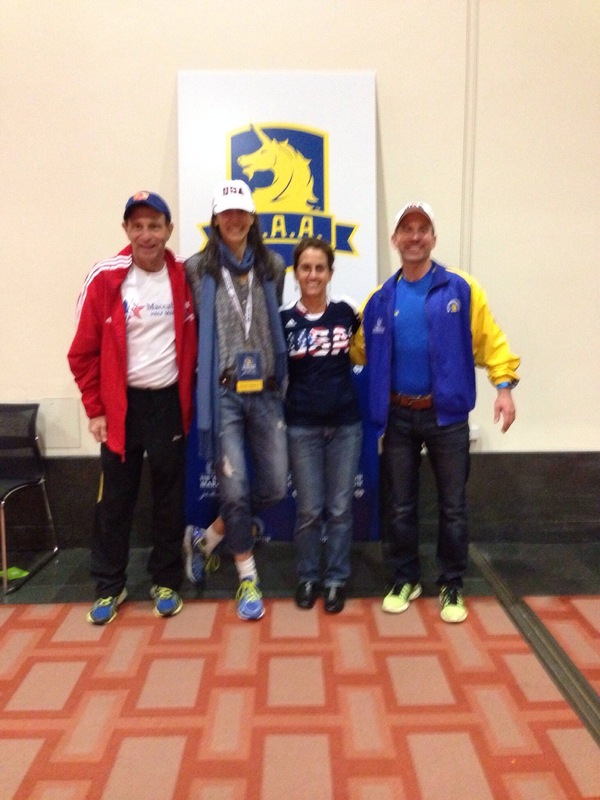 At the EXPO i met up with some of my teammates from the MACCABIAH Half Marathon this past summer. It was nice to see them. After leaving the EXPO we walked right past where the bombs went off last year. This was sobering to say the least. I did not explain too much to my kids about the significance of the location but did take a photo so we can discuss more when they are older. 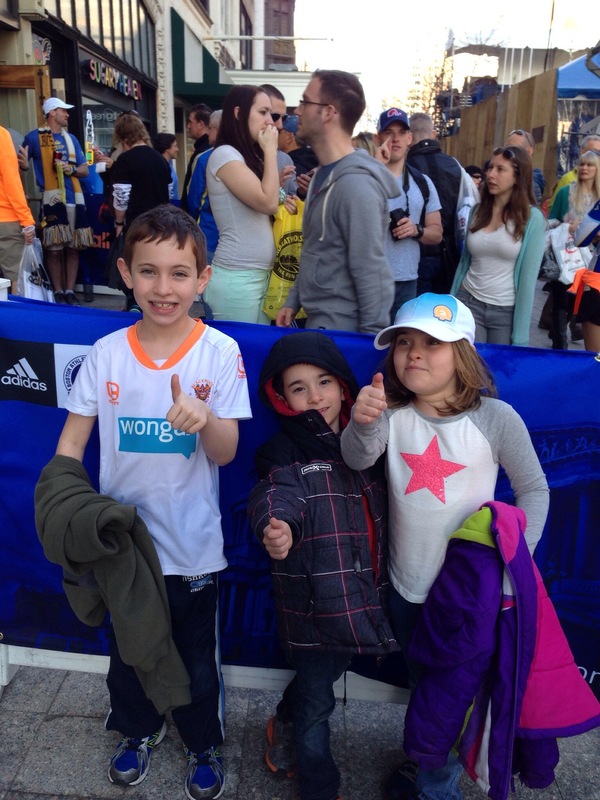 Kids at the Marathon Sports location near the finish line. The site of one of the 2013 explosions. 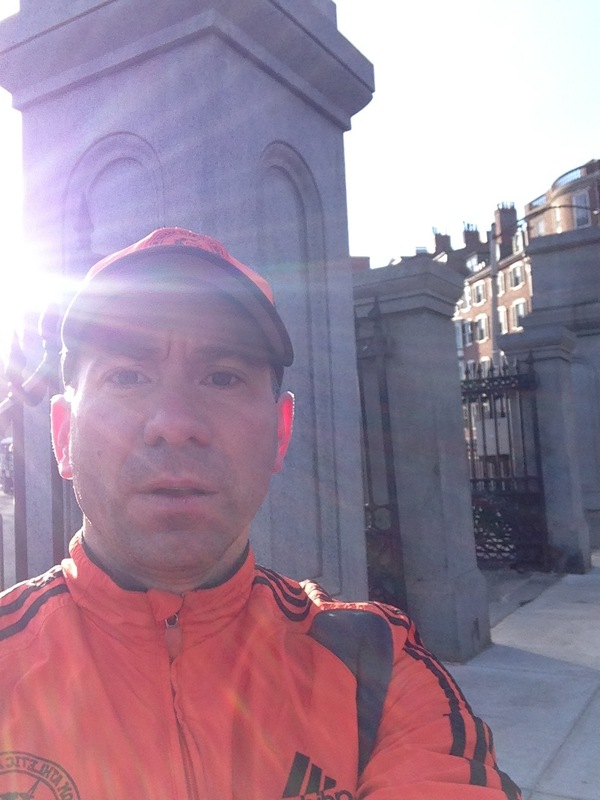 The following morning, I met Pete in Boston Common for a quick 2+ mile shakeout run… It felt great to get in a run in Boston! 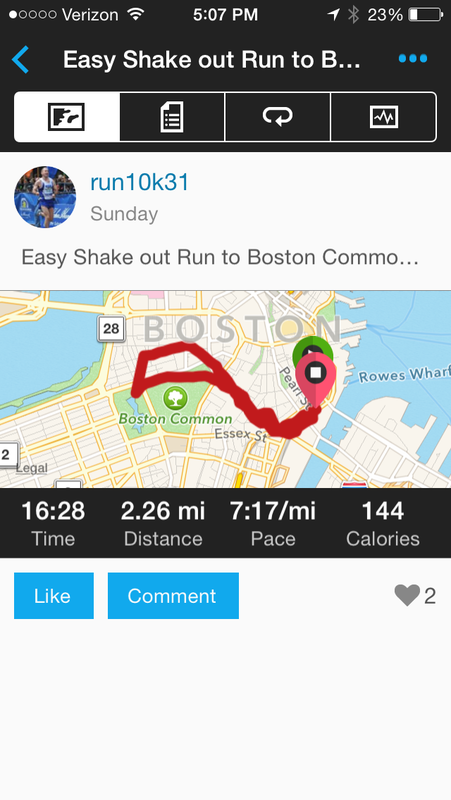 Morning shake out run in Boston Common. 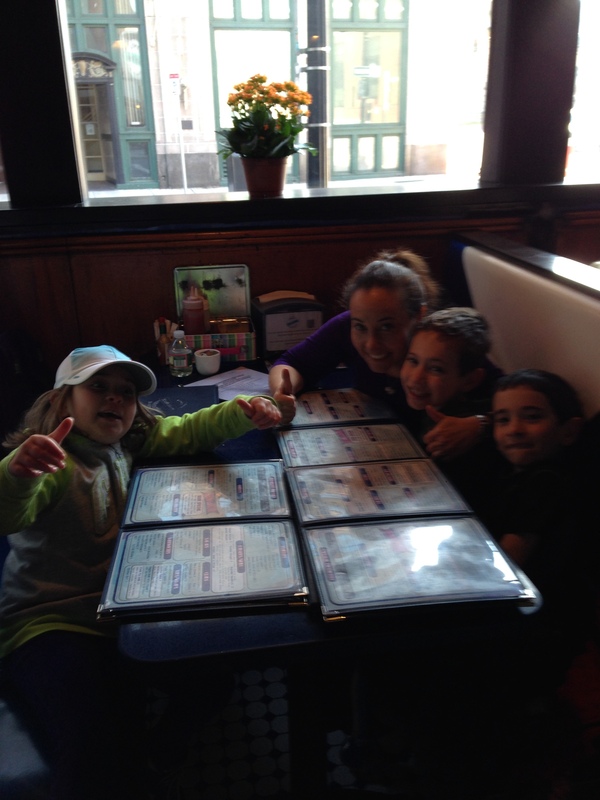 After the run we went to an awesome little diner for some breakfast. 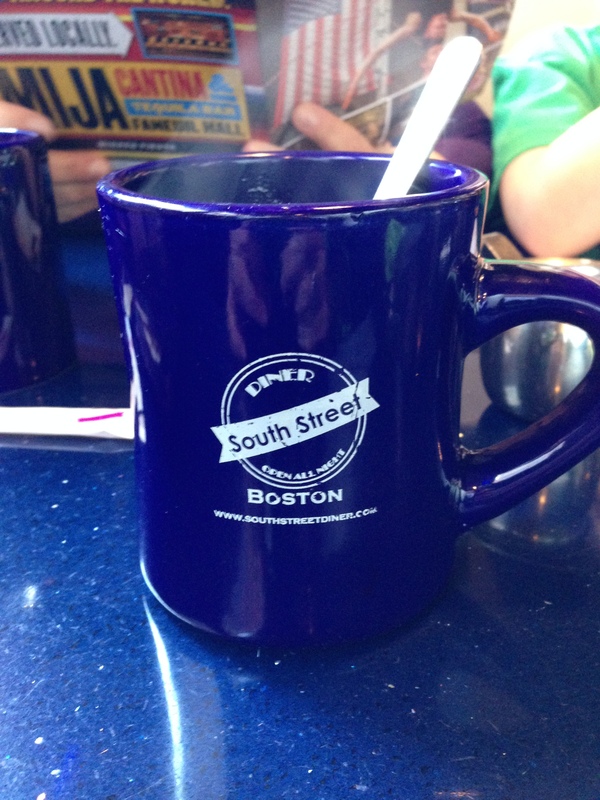 The South Street Diner. It was awesome. 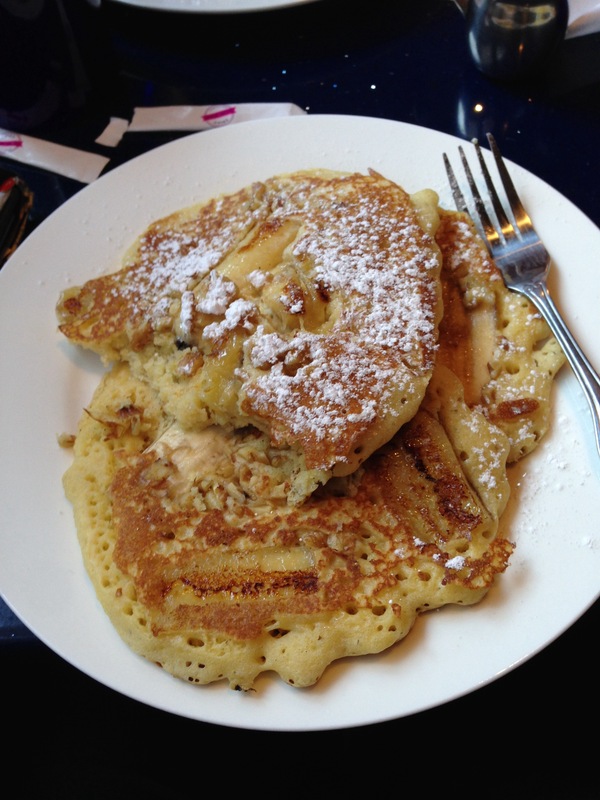 I cargo loaded on some banana walnut pancakes! YUM! 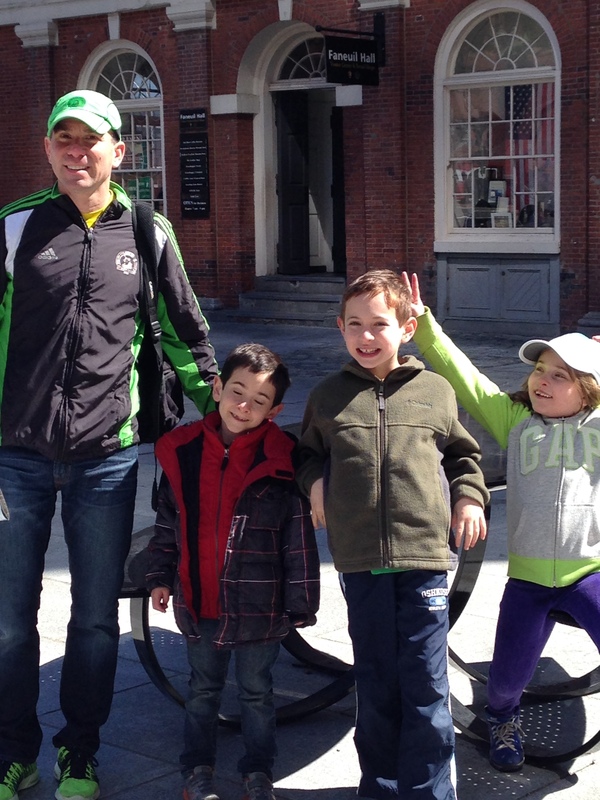 After breakfast we stopped by Faneuil Hall and Quincy Market! The kids LOVED it!! 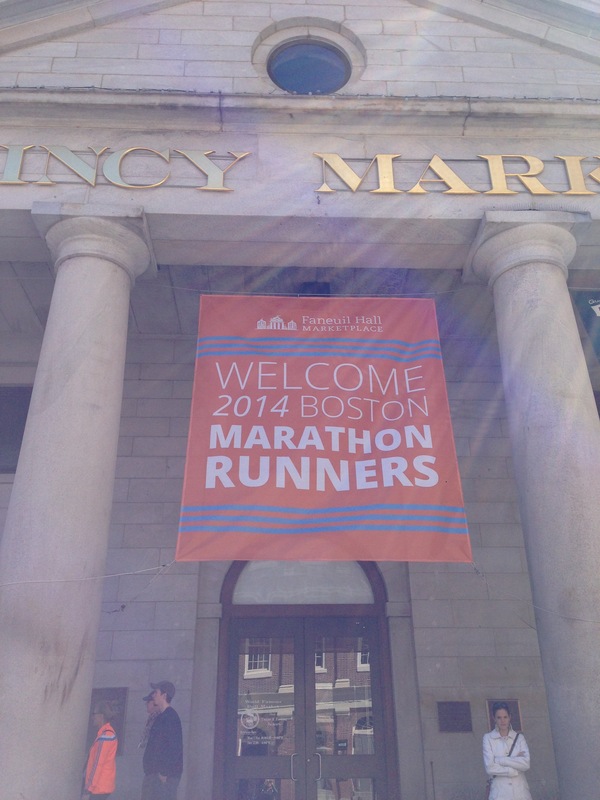 Banner Welcoming the Runners to Quincy Market! 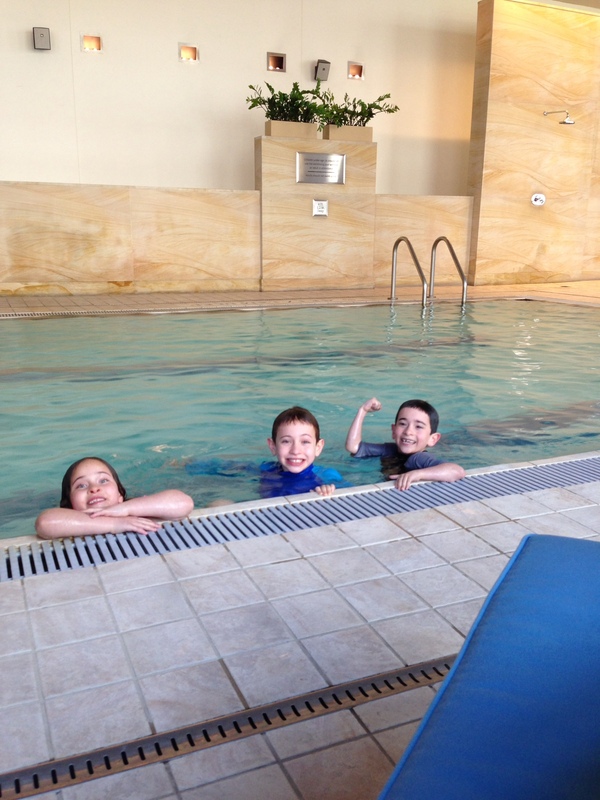 After a busy morning I got to relax while the kids hit the hotel pool! 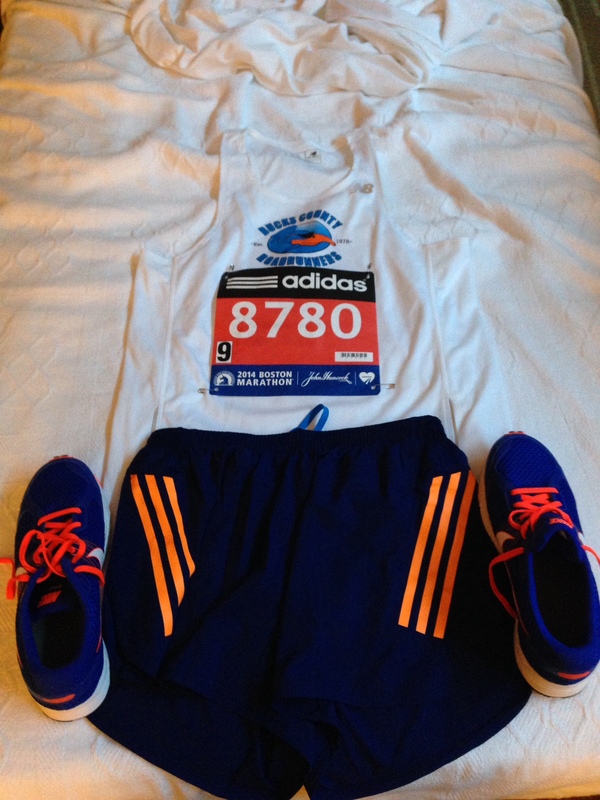 After that I got my stuff ready for the next day before we headed to the BCRR pre marathon team pasta dinner. The team dinner was held at a place called Ricardo’s. The idea was a good one and they had a table that accommodated 23 of us! That said the food was basically adequate as they tried to have all our meals ready at once so much was barely warm. 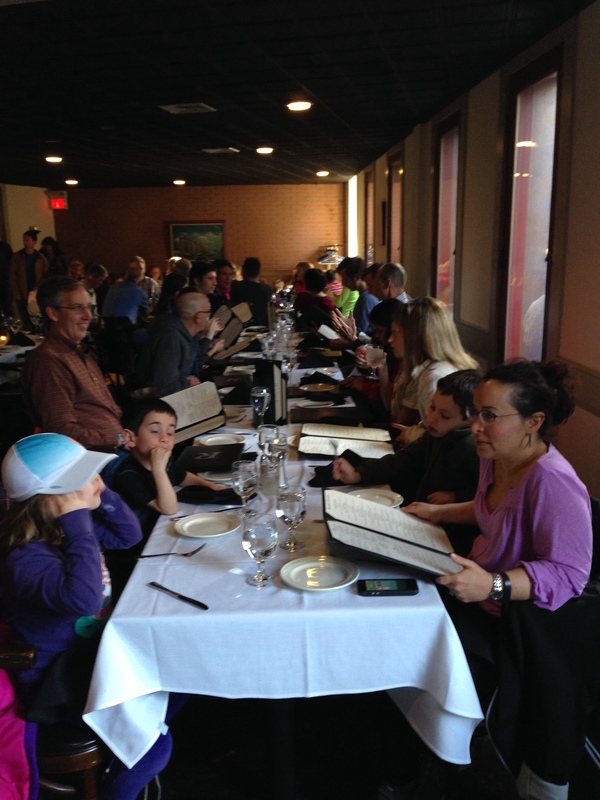 BCRR Runners (plus families) at the Team Dinner! 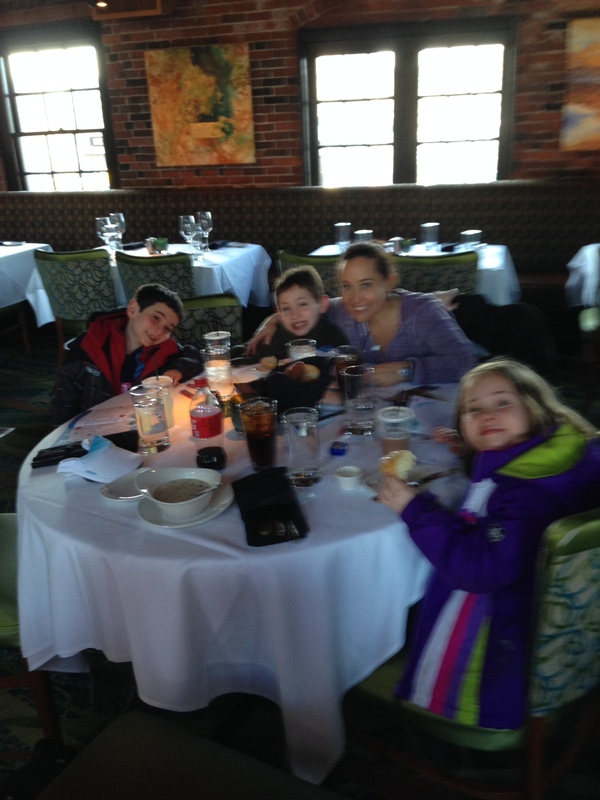 The table did get serenaded which the kids loved!! 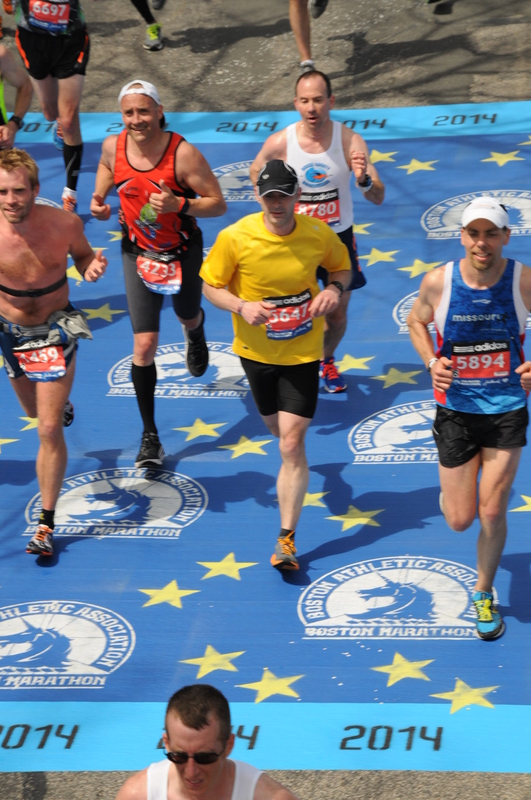 When we went back to the hotel it began to really hit me that the race was fast approaching. I woke up WAY early (4:30am) without needing an alarm and began to get ready. At 5:00am I had some oatmeal and banana with enough coffee to get things moving. 🙂 At 5:30am I left the hotel and walked easily to Boston Common where I met Pete and Joe. 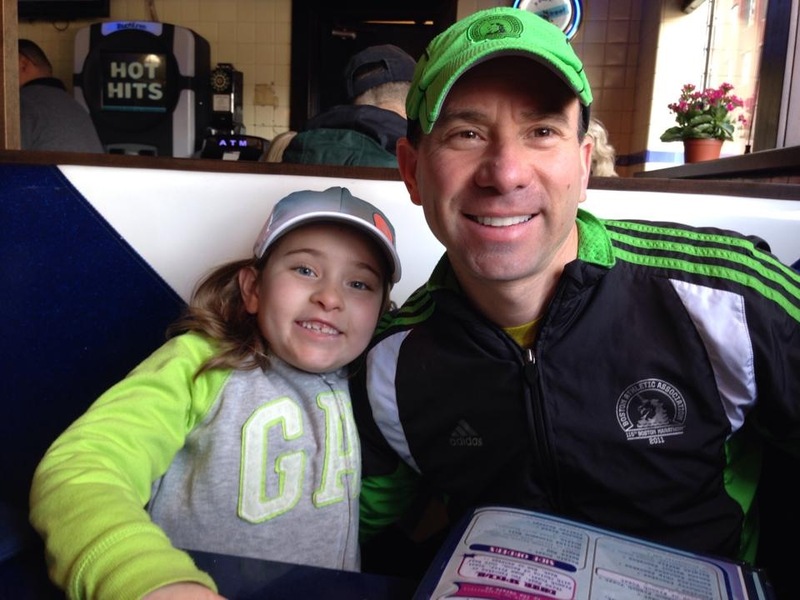 Joe had met up with a really good runner who works with his son. 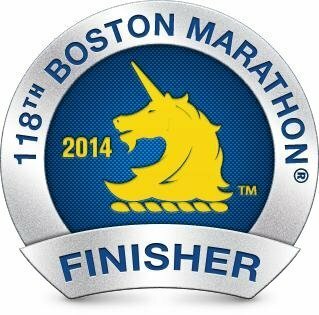 This was great as the 4 of us took the bus together and hung out until leaving Hopkinton High for the start. I made sure I had a mat to lay on and plenty of warm clothes that I know were to be given away. There was no bag check in Hopkington so anything taken there was either worn to the finish or donated! 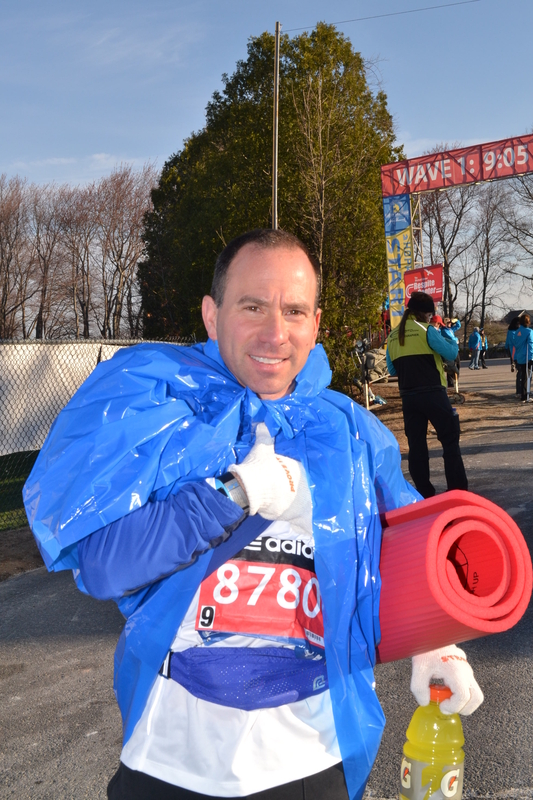 At 9:05am they called wave one to the start so we started out trek to the starting line. As they loaded the paddocks within each wave by Paddock number Pete got to leave first and Joe and I left after. Pete was in Paddock 4 Joe in 7 and I was all the was in the back in Paddock 9. I was this far back as my qualifying time was the 3:12 I ran at Lehigh. I was concerned about how crowded thing would be and as it turned out I had good reason. It took me almost 7 minutes just to get to the stating line! 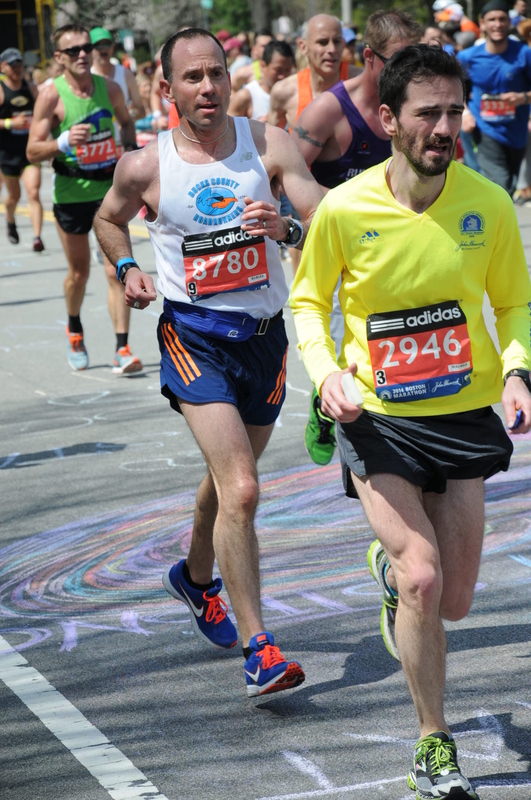 For the first half of the race I was stuck in traffic. I managed to hold my goal pace of 6:45 min/mile but I did it by constantly looking for holes to zip through to pass people. 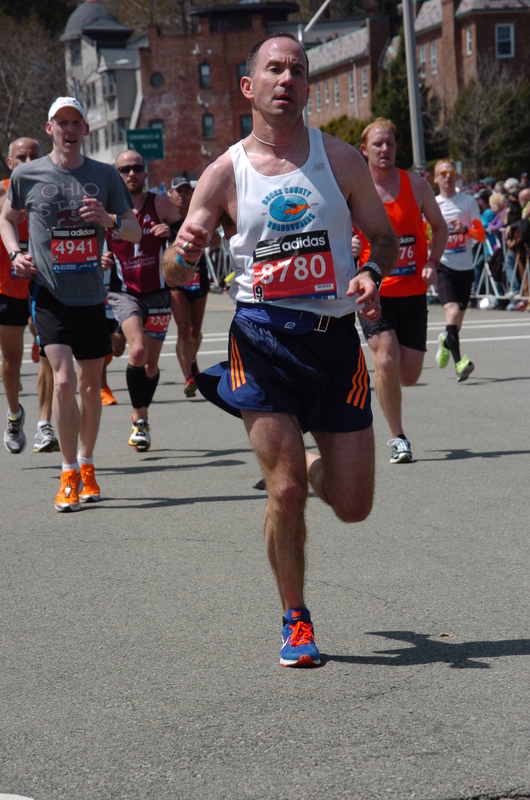 I tried not to panic too much and I did manage to stay relaxed but it took energy contantly looking for room to pass. Getting water or Gatorade was work as well as it was so crowded many people were reaching for the same cup and people often stopped right in from of me. Again, a lot of work to be very aware of what others were doing. Things did open up once we hit the Newton Hills but the damage was done by that point. The Underpass that Always Hurts. One Kilometer to go so close! 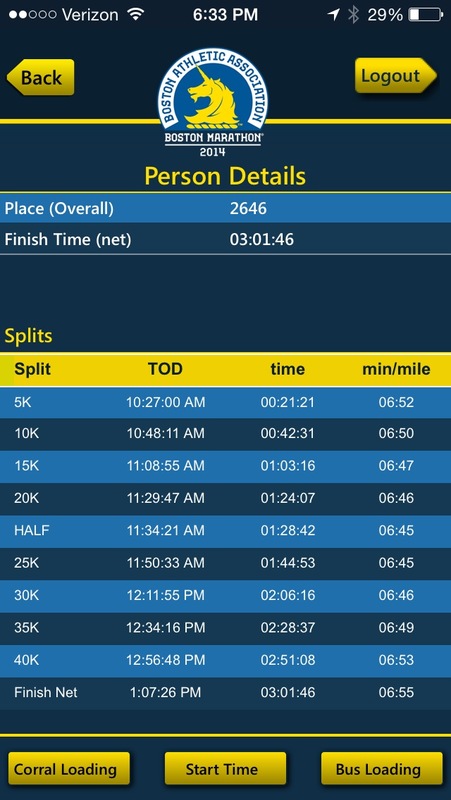 I ended finishing in a time of 3:01. Not terrible but not what I was hoping for. 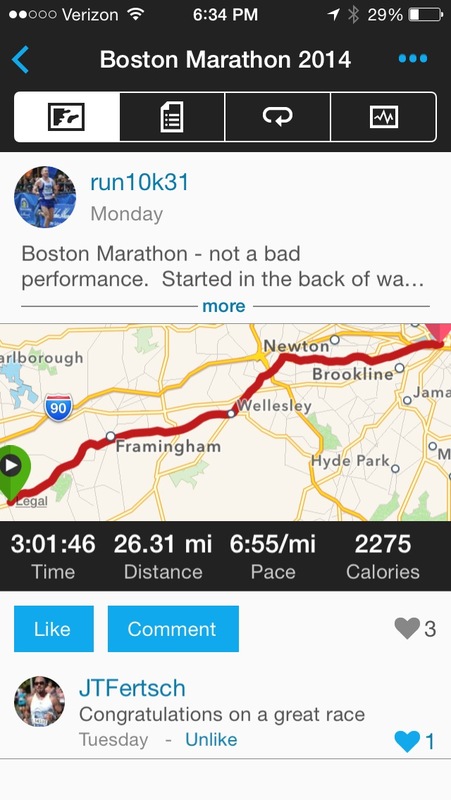 I simply had to waste too much energy in the first half to keep from running the first half at 7:30 min/mile pace. 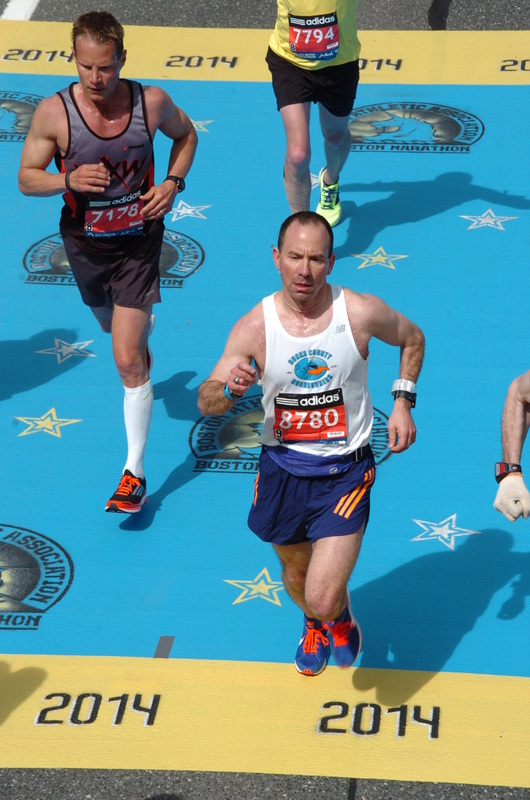 After finishing despite feeling good the entire race, I started getting nauseous again. So another trip to the med tent. 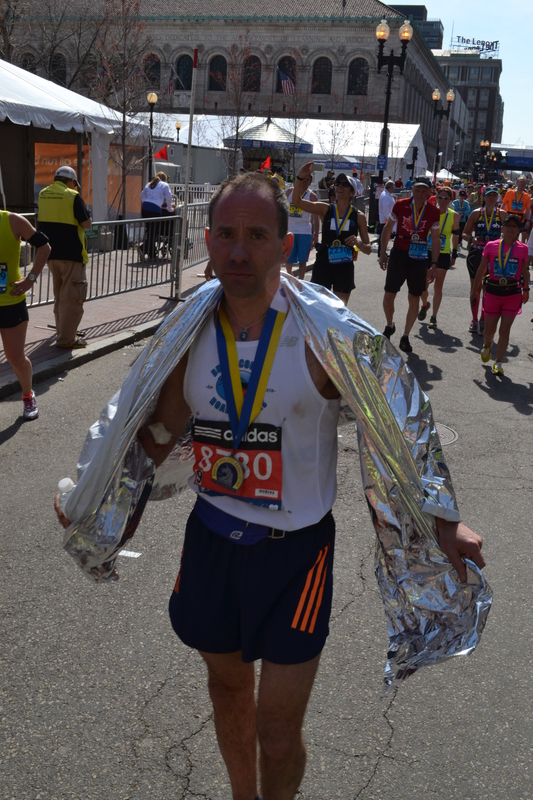 It looked as if I was going to avoid an IV until the medical staff pushed me to drink gatorade in addition the cold water I was drinking with no issue. The Gatorade made me more nauseous and I started puking so in went the IV. I was able to get a cell phone to give Leslie a call and I waited another 1.5 hours for the IV to finish before they would let me leave. 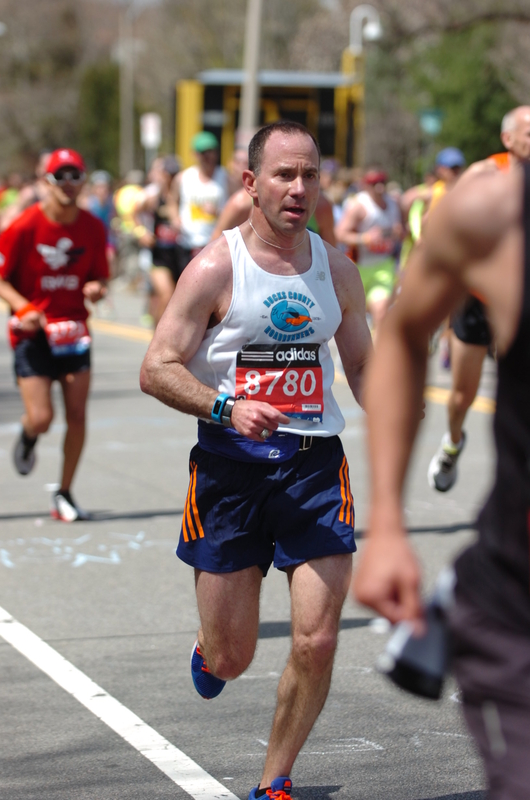 So I was walking towards Boston Common with the 4+ hour marathoners rather that the 3 hour folks with whom I finished . Oh well…. 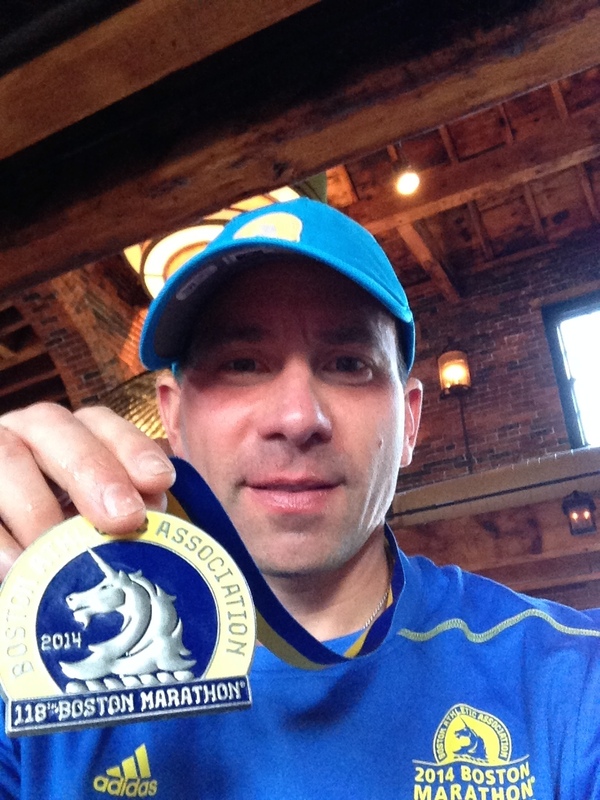 Wearing the hard earned medal! Again, hard to believe it is over! At least I will have a better seed for 2015! !